I'm a single mom who reads too much. 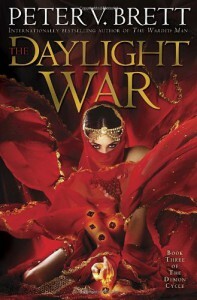 The Daylight War was disappointing to me, especially after the second book, The Demon Spear was so well done. The second book laid the groundwork of a religious war between the two nations just so they both could fight a common enemy, the demons. Unfortunately instead of a war the author brought more characters, and more background about who was fighting, very little on why. I expected so much more and unfortunately felt as I wasted my time and perhaps could have skipped this book for #4. The only good thing was the cliffhanger ending that forced me to jump right into The Skull Throne just to see what happened. I will finish out the series just because I want to know why the Demons are so powerful, what happened to the humans that they are mere fodder and why the two nations have drifted so far apart in their natures. Let's hope we find out.